I love swallows, and just had to get one in! Barn swallows live all over the British Isles and are widespread in the Northern Hemisphere, migrating south in the winter. They eat flying insects and are 17-19 cm long. Swallows distinctive long, forked tail makes them easy to identify from other martins and swifts. They have a wonderful aerial expertise and facility that allows them to catch and eat insects, mate, and feed their young in flight. Their cupped nests are made by males and females who can make a thousand trips to collect the necessary mud – they would originally have made these nests in caves and cliffs, but now prefer to use barns and man-made structures – which keeps them returning year after year to delight us with their swooping, soaring summer evenings. Barn swallows are Amber listed by the RSPB due to population declines across Europe. Illustration © Liz Brownlee, please do not post elsewhere, you may link to it. Swallow info available here from the RSPB. 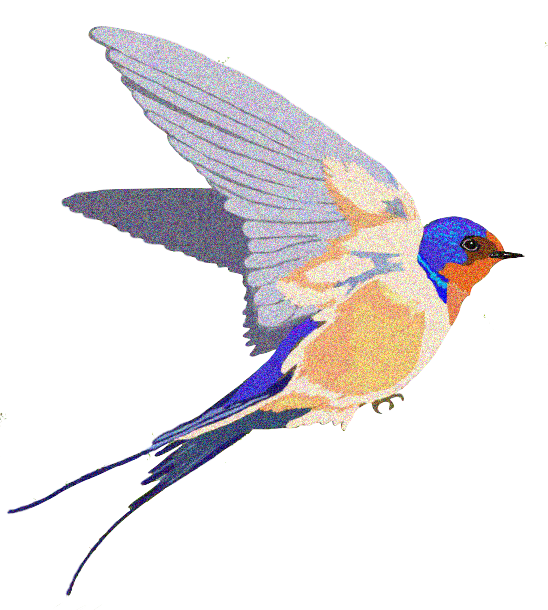 More swallow information and links here at the BBC: BBC website, swallows. Thanks sharkbytes, I will drop by later. I have heard of you, talking to others who are doing the challenge, your fame precedes you – the shark person reading every blog! Someone worked out how many it was a day and it was a LOT!! Great poem – you sure go to a lot of trouble every day! Love swallows too and of course there is always for us the saying – one swallow doesn’t a summer make….